Dosbat: Arctic Sea-Ice in the Little Ice Age. Arctic Sea-Ice in the Little Ice Age. Here's Tamino's description of the method used by Kinnard et al. Kinnard and his coworkers collected 69 proxy data records from the Arctic region, mostly from ice cores (using oxygen isotope ratios, percentage of infiltration ice, and sea-salt ions) but also including tree rings, lake sediments, and historical data of sea ice observations. Many of the proxies have information about physical properties other than sea ice extent — especially temperature — but the analysis method chosen (partial least squares) enabled the authors to identify modes of variability in the proxy data which are distinct from the temperature signal, and which correlate with observed sea ice extent. This method also helps overcome the “collinearity problem,” in which multiple proxies are so similar to each other that they provide overlapping information. I've not yet read the actual paper (it's paywalled - I have read it now and there's a link at the bottom of the page), but I've always found Tamino to be honest and capable, so I'll go with his explanation. What interested me in particular was the comment about the Little Ice Age (LIA). Here's the key graphic from Kinnard et al. Figure from Kinnard et al. the period from 1 C.E. to 1900 C.E. (Fig. 3C). changes in solar irradiance (30). Leaving aside the bleedin' obvious about present sea-ice conditions being exceptional in the context of the last 1400 years. The LIA was around 1600 to 1800, a period of unusual cold in Europe and probably elsewhere in the Northern Hemisphere, Kinnard et al shows that at the time the Arctic experienced a dip in sea-ice extent. That's an apparent reduction in sea-ice at a time of purported cooling. There's a denialist fringe that wants to explain all climate change in terms of the Sun (insolation) or Earth's relationship to it (e.g. Milankovitch Cycles). The behaviour of the Arctic seems to present a problem in terms of this brute force relationship between insolation and temperature. However as I've discussed previously there is reason to expect a more subtle solar impact upon terrestrial climate. Lockwood et al studied the relationship between a measure of solar activity and the Central England Temperature series, using the latter as indicative of European conditions. They found a significant relationship between periods of low solar activity and cold winters, these cold winter periods seeming to be related to blocking high atmospheric activity. James Overland has recently connected the 2009/10 winter with the Warm Arctic Cold Continents (WACC) pattern, a pattern he states has previously occurred in 1969, 1963, 1936, and 1881 (ref). WACC events are caused by high pressure in the Arctic associated with breakdown or even reversal of the polar vortex, and accompanying high pressure in the mid-latitude continents (ref, ref). This causes cold Arctic air, usually kept hemmed in by the polar vortex, to spill out into the mid-latitudes being replaced by warmer mid latitude air. It should be borne in mind that the recent 2009/10 winter happened at a time of exceptionally low solar activity supporting Lockwood's contention. However evidence from both models and observations support a link to reduced Arctic sea-ice extent in both Summer and Winter as I've previously discussed. This is not an either/or situation, both processes may be at play. The CET was used by Lockwood et al because it is the longest available instrumental temperature series, however it is not ideal for the purposes of determining the WACC pattern. For example, although the winter of 1963 was exceptional in the UK, the winter of 1969 was not notably cold in the UK, whilst it was notable in the US and Russia, i.e. GISS Maps. The UK is at the edge of the Atlantic so during a blocking high event it can be a battle ground between westward low pressure systems and the eastward European blocking high. It's quite possible for Europe to be frozen solid while the UK experiences mild air flows from the Atlantic. Thus 1969 didn't tally in Lockwood's study because the UK didn't experience a record winter. However it seems reasonable to me to stretch the finding of Lockwood et al and ask if the cold winters driven by low solar activity were also associated with an increase in WACC patterns. One warm winter in itself would not make a great deal of difference to the Arctic sea-ice, as I've discussed on several occasions first year sea-ice is quick to bounce back from perturbations, and provided there isn't a background forcing acting against the survival of sea-ice, ageing and consequent rebound of multi-year ice is inevitable. However a period of repeated WACC patterns could produce a sustained recession of the sea-ice edge by reducing winter sea-ice growth. The reduced volume going into summer could then be translated into a reduced area even if the volume loss during the melt season were unchanged. So perhaps it should not be that surprising that during the Little Ice Age there was a small recession of the Arctic sea-ice, rather than an increase. Kaufman et al, 2009, "Recent Warming Reverses Long-Term Arctic Cooling." 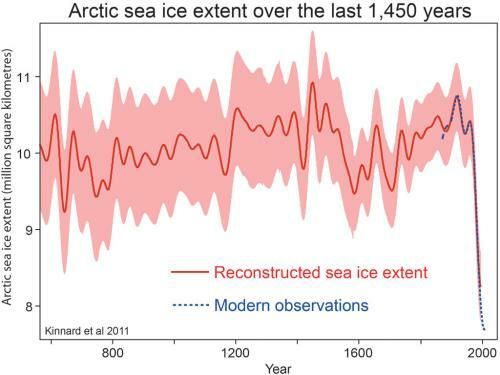 Kinnard et al, 2011, "Reconstructed changes in Arctic sea ice over the past 1,450 years." Abstract. A PDF is available here. Lockwood et al, 2010, "Are cold winters in Europe associated with low solar activity?" Its refreshing to read a balanced view on the whole arctic / LIA issue. Most peoples opinions are based on ignorance and are totally polarised. it easy for the uneducated and or unintelligent to get facts wrong and distort the truth. When the sea rises and floods or starves several billion people then maybe the climate change deniers will accept that the world left it too late to prevent the damage. The arctic is very soon going to be an open ocean sucking in heat and switching the whole climate system into another pattern which will bring utter chaos and destruction. Sad but true. The Earth will be better off without us doing what we are doing. It is of course a pity for the ecosystems that are currently 'in the way' of the effects of climate change. But taking a longer view the Earth will very likely survive what will be just another of a succession of extinction events. Taking that longer view - what we do we do to ourselves. Cold Winters: The Arctic Connection. Cold Winters: The Snow Advance Index. AGU: Hansen, Rohling & Caldeira. Frozen Planet: Fact Checking David Attenborough. Frozen Planet: Fact Checking Nigel Lawson.